When people wonder why there is such hostility to the intellectual property framework in the United States and how companies are allowed to inflict intentional damage into their products in the name of 'copyright protection', Blizzard is a poster child for some of the worst behavior. When you buy a software package from them, you don't actually buy the right to use that software on your computer. You buy the right to maybe sometimes use that software under certain circumstances solely under Blizzard's discretion. Oh, but I forgot, hampered functionality is what customers are demanding. After all, as senior producer Alex Mayberry helpfully explained to MTV, "with our games as a whole we're tying everything into Battle.net these days...We can provide a much a much more stable, connected, safer experience than we could if we let people play off-line." How do you like them stable and connected and persistent apples? Apparently Blizzard customer service likes 'em so much they don't even respond to support requests. But the exclamation points make it all okay! Update: Contrasting the corporate spin with the actual legal agreement is downright hilarious. THE SERVICE IS PROVIDED ON AN "AS IS" AND "AS AVAILABLE" BASIS FOR YOUR USE, WITHOUT WARRANTIES OF ANY KIND, EXPRESS OR IMPLIED, INCLUDING WITHOUT LIMITATION THE WARRANTIES OF MERCHANTABILITY, FITNESS FOR A PARTICULAR PURPOSE, TITLE, NON-INFRINGEMENT, AND THOSE ARISING FROM COURSE OF DEALING OR USAGE OF TRADE. 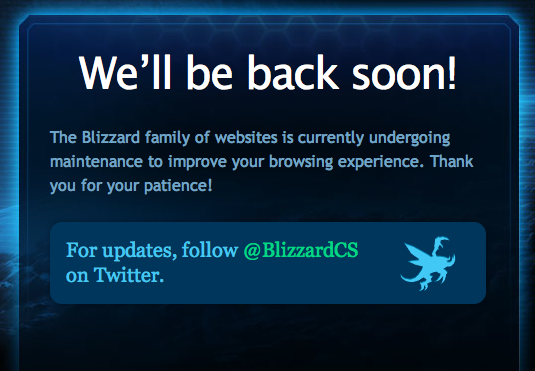 BLIZZARD DOES NOT WARRANT THAT YOU WILL BE ABLE TO ACCESS OR USE THE SERVICE AT THE TIMES OR LOCATIONS OF YOUR CHOOSING; THAT THE SERVICE WILL BE UNINTERRUPTED OR ERROR-FREE; THAT DEFECTS WILL BE CORRECTED; OR THAT THE GAME CLIENT OR THE SERVICE ARE FREE OF VIRUSES OR OTHER HARMFUL COMPONENTS. Steve Jobs is so confident that the mobile computing space has been filled out that he's stepping down as CEO. What a run. Guess my new old iPhone will be my last Jobs smartphone (just in the nick of time, to boot!). Apple has so defined mobile computing that the 'post' era can simply leave off the smart. From crackberries to droids, they're just phones. We simply expect that our email, contacts, websites, maps, games, alarm clock, weather, sports scores, calendar, stocks, music, photos, and more are available at the touch of a screen. How long we've come since the time when my Nokia phone was stolen and it took me hours to key in phone numbers in that Motorola Razr. Wanna bet he goes out with a bang this fall? It will be fun to see what my first Cook phone will be. If the 3GS lasts nearly as long as my original iPhone, I may have to wait a few years! So at work we were discussing some investment things, and it was mentioned that the stock market was down over 4 percent today. That's in one day. I checked Yahoo Finance just now and yep, it's pretty bad. 'Government by Dow' has been a fun turn of phrase over the past few years, capturing government's capture of the common good by a much narrower set of interests on Wall Street. But when even Wall Street hates your policies, maybe it's time to rethink. Or at least ask, what is going on? The day the 'grand bargain' a/k/a debt deal a/k/a CYA for cutting popular programs passed the House, the Dow fell from 12144 to 12132. Then on Tuesday, when it passed the Senate and Obama signed it into law, the Dow closed at 11867. Today, the Dow closed at 11384. But, I know, whocouldanode that idiotic public policy is bad? Or maybe the efficient markets theory is wrong, and The Market isn't right that the debt deal is awful. Wait, what's that about unstoppable force hitting immovable object again?